04.13.2015: Oh, Godzilla – What Language! It’s an episode without a special topic or agenda, Rachel, Bryan, Kyle and Jeff simply talk about stuff and things. Holy crumbcakes, we made an explicit episode! Yeah, so let’s get that out of the way now. 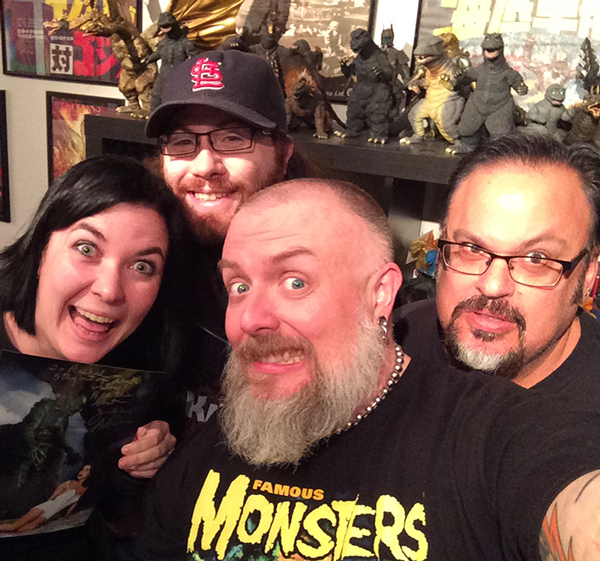 Not like we spend the entire episode swearing like crazed sailors, but we removed our “family friendly” filter for this episode and just talked about stuff like Monsterpalooza, collecting toys and Godzilla stuff, zombie movies, going to Japan, Kaijucast merchandise and all sorts of other things. We also answered some emails from listeners that date back to the beginning of the year! That was a lot of fun, actually. So, if you like these types of shows and want to hear more from your Kaijucast hosts, please let us know and we’ll be happy to record more of these conversational episodes (they are a lot easier to do than our standard over-planned shows). If you haven’t done so, please go support John & Chris’ kickstarter campaign, Symphonic Fury! The Music of Japanese Monsters. They cannot make this concert happen without the support of kaiju fans like you!